SAME DAY DISPATCH on all orders before 2pm weekdays, LETTERBOX FRIENDLY packaging! 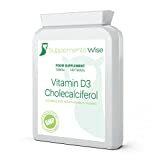 Viamin D3 tablets from Supplements Wise provide a high strength supplement with an optimum recommended dose of 25mcg (1,000iu) of vitamin D3 in each tablet. Vitamin D3 is the form of vitamin D that is made in the body and therefore is far more easy to absorb and retain than other forms. Vitamin D3 has long been recognised for its many benefits, most notably its contribution to the maintenance of normal bones and teeth where it plays a key role in ensuring a sufficient level of calcium is present in bones. Other benefits of vitamin D3 include boosting the activity of immune cells and a further contribution to both heart and brain health. Vitamin D is a fat soluble nutrient. Vitamin D is found in Cod liver oil, vitamin D-fortified foods, egg yolks and butter. However, the majority of vitamin D in the body is created during a chemical reaction that starts sunlight exposure to the skin. This is why vitamin D is often referred to as the sunshine vitamin.